inscription: Bottom edge has "Black Sheep Press '69"
Poster has an outlined banner at the top with "Free the Soledad Brothers" printed in it. There are three black and white photographs with labels under. The top photo has "Photograph by Ruth-Marion Baruch - George Jackson." The bottom left photo has "Photograph by Camilla Smith - John Clutchette." The bottom right photo has "Photograph by Ruth-Marion Baruch - Fleeta Drumgo." 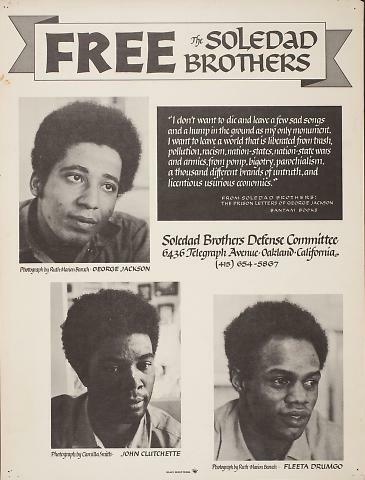 The top right has a black box with white text that is a qoute from "Soledad Brothers: The prision letters of George Jackson Bantam Books." Below the box is "Soledad Brothers Defense Committee/ 6436 Telegraph Avenue - Oakland - California (415) 654-5867."